As always, we like to keep our blogs current with what is happening at the Dive Sites here in Cyprus and over the past 12 months, we seem to be seeing more and more sea horses here around our Protaras Coastline. So, what do we need to know about Sea horses if we are Scuba Diving with them? The name Hippocampus comes from ancient Greek. Hippo translates as Horse while Kampos (campus) means Sea Monster. I know what you are thinking... a tiny little seahorse as a Sea Monster, where did that come from? Well in Ancient Greek Mythology, the Hippo Kampos was a creature that sported a Horse's head and shoulders while its hindquarters were coiling, scaly and fish-like. According to the mythology, the Hippo Kampos was closely related to the Sea Goat, Capricorn. There is a myth that Seahorses mate for life. Unfortunately, this is not true and they will readily switch if the opportunity arises. However, they may court for several days before mating and this may involve swimming side by side while holding tails or holding onto the same blade of grass while dancing around it. Eventually, when ready, the male will open up a pouch on the front of his tail to show his mate that it is empty and she will fill it with around 1500 eggs. The female departs and the male will carry the eggs for between 9 and 45 days. Once they are ready, the seahorses emerge. There can be, on average, between 100 and 1000 seahorses, which are extremely small but fully formed. At this point, there is no more care from daddy; Just a cheerio, best of luck, where's my next mate? Alongside Razor Fish, sea horses are the only species that swim vertically through the water column. This makes them very vulnerable in high winds and rough seas, as they tire easily. They move through the water by rapidly fluttering a dorsal fin while using pectoral fins that are located behind the eyes to steer. 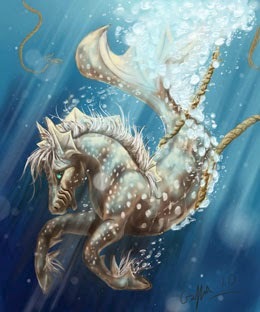 Maybe it is for this reason that the sea horse doesn't tend to travel far. They make territories for themselves and the males tend to stay within a square metre of this while females can travel up to 100m squared. A seahorse is very sensitive to Stress and to light. When you see a Seahorse while Scuba Diving, keep a good distance and make sure you are neutrally buoyant. I find the Zoom works extremely well to get good photographs of a seahorse. Use natural light where possible, as strobes and dive lights do stress these little creatures. If you must use a light, try a red filter to create a softer more diffused light which they should be less sensitive to. NEVER try to touch it!!! Local Diving Couple, Dawn and Norman join us for a jolly bimble around Cape Greko in Protaras, Cyprus. There is always something different to see at this dive site and we love going back there just to see what we can find. With clear waters and warm sunshine, what more can a diver need. 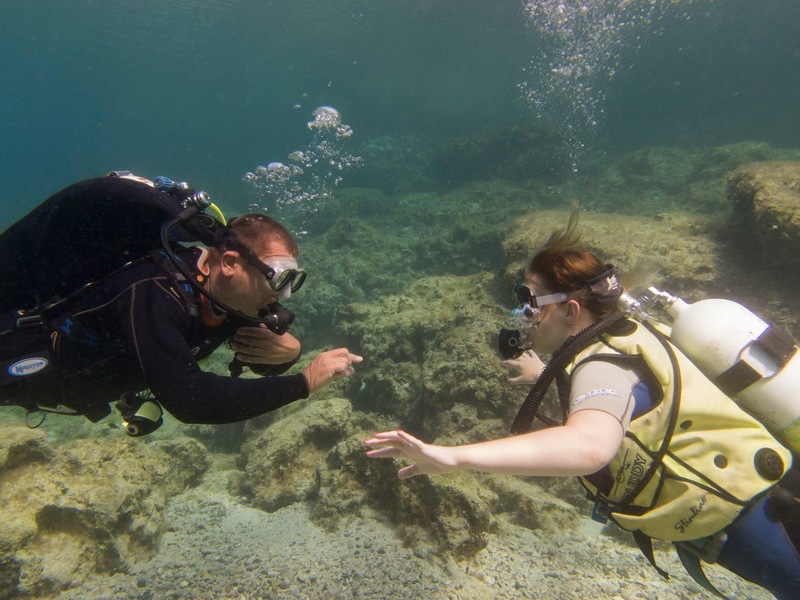 As we continue to look at the basics of buoyancy control when Scuba Diving, we come to possibly the most common means of adjusting buoyancy, which is breathing. As we discussed last week, the Buoyancy Control Device can be used to adjust a diver's buoyancy but the experienced diver will only use this for large changes in buoyancy such as ascent and descent. For minor changes, we prefer to use our lungs. Please bear in mind that this will only work for those using open circuit and rebreathers are a totally different kettle of fish! Imagine you are scuba diving alongside a wall maintaining great buoyancy mid water at 30m when suddenly looming ahead of you is a beautiful Fan Coral in your direct line of travel. You decide that the easiest way to get around it is to ascend slightly and swim over it. What do you do? One possibility is to add some air to the BCD to ascend but this will expand as you ascend and it gets a bit messy when you start adding and subtracting air from your BCD for these minor changes. The best practice in this situation is to breathe in deeply. When we take a deep breath, we increase our buoyant force in the water (if you do not know what this is, please refer to our Buoyancy Basics 1 article) and become a little bit more positively buoyant. You will find that you begin to rise in the water, at which point, you simply have to begin to exhale for control. Equally if you want to descend slightly, you can breathe out a bit further, making your lungs a bit emptier than you would normally have them. You will begin to descend and then you can just inhale for control. At NO point should a Diver Hold their Breath!!!! Using breath control to adjust your buoyancy is very easy but it does take a lot of practice to get it spot on. However, you will have already started to learn this technique with Hovering skills, ascent and descent training on your basic scuba diving courses. 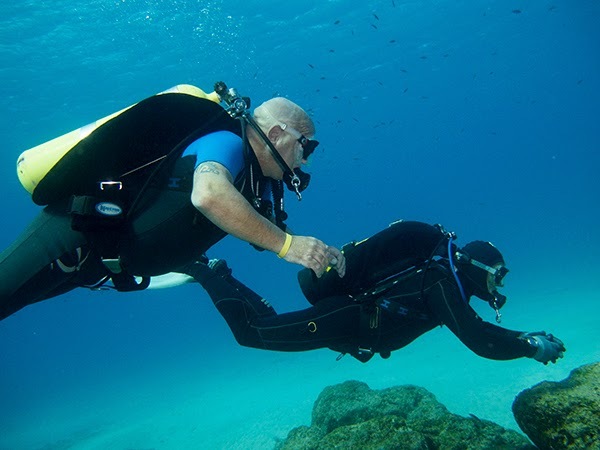 I have seen a number of divers over the years that have insisted that all the dive should be controlled using breath control and only inexperienced divers have to use the BCD. There is a reason we have a BCD and it should be used to make big changes in buoyancy while breath control is for the small changes. If we didn't need the BCD, we wouldn't have it! 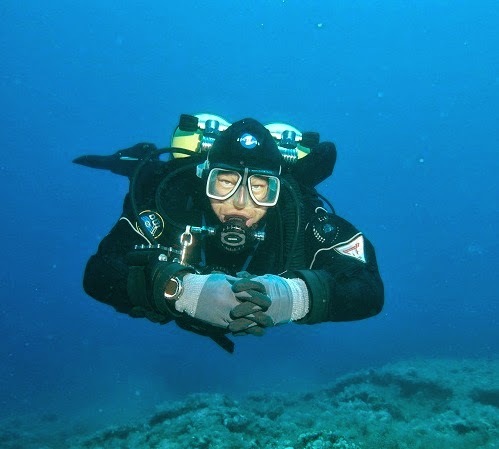 So when you are learning to improve your buoyancy skills when scuba diving, remember there are a number of things to consider underpinned by Archimedes Principle and Volume/Density relationships (which we will look into at a later date) and you have been given the tools to control buoyancy, so make use of them. You will find that the easier you can make your diving; with good weighting, using BCD and breath control, the easier it will be to achieve perfection. 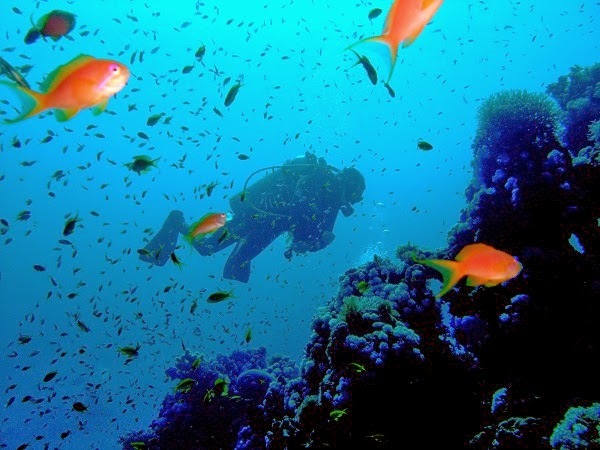 When you are Scuba Diving, it should not feel like you are exerting yourself. If diving feels strenuous, you are generally doing something wrong somewhere. Most experienced Divers (not the ones pushing the boundaries of scuba who can experience stress but for very different reasons) will tell you that diving should be a relaxing, easy past time... and they are right. Perfecting your Buoyancy Skills is the best way to make your diving strain free and now we understand the basic principles behind buoyancy, we can look at what we can do to make our diving better by improving this core skill. 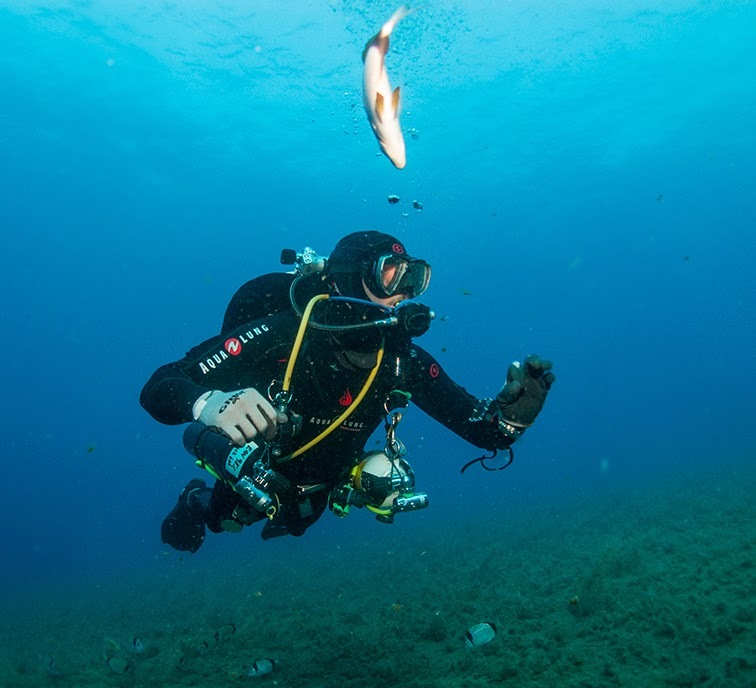 There are a number of things that affect buoyancy and we have previously discussed weighting for scuba diving and, hand in hand with weighting is use of your Buoyancy Control Device (BC). Whether you dive in a wetsuit or a drysuit, your primary means of buoyancy control should be your BCD or Wing, which makes this piece of diving equipment crucial to perfect buoyancy control and having the correct BC for the diving you do is essential. 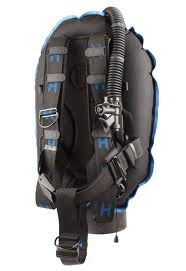 So, a BC (whether jacket style, wing or sidemount BC) is basically a bladder to which you can add or subtract air to control your position in the water column. It will have some means of actually adding the air and this is usually through a low pressure system, allowing you to add air from the cylinder, while dump valves are used to release air, alongside an Over Pressure Release Valve (OPRV) to prevent over filling. 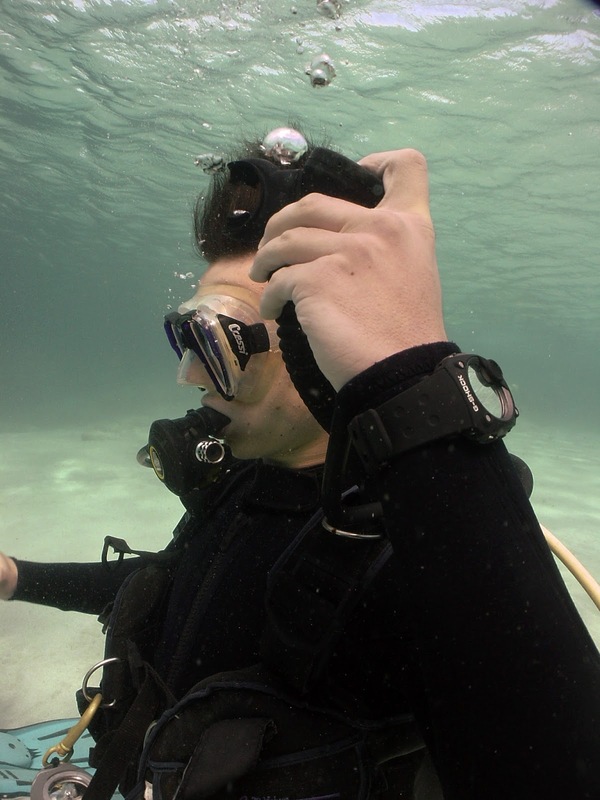 Before any dive, you should check your BCD is working correctly by connecting it up to the cylinder and inflating it fully until the OPRV kicks in. Then check all the dump valves to make sure nothing sticks open or closed. On the dive, you should add air in small amounts on the descent. to add more air to equalise it to the ambient pressure. Equally, as we ascend, the decreasing water pressure causes the air in our BC to expand and we need to release some. Again, this release of air should be in small amounts and you should ensure that the valve you are using to subtract the air from the BC is the highest point in the water, as air rises. If you are using the Over the Shoulder Inflator/Deflator, you must hold this up above your head and come into a more head up position in the water. If you are an advocate of the kidney dump to stay in trim, you must roll slightly to make the kidney dump the highest point in the water. It is important that you know how to operate the BC and know where all the controls are without having to fumble, so you can make a speedy adjustment, if needed. This is where a check dive can be invaluable if you are hiring equipment and getting advice from someone who knows what they are talking about is second to none when buying your own kit. BCs are pretty standard for a reason. They work! Variations are quite often just gimmicky sales pitches that are more likely to hinder than help and with a piece of Diving Equipment that is so central to the core Diving skills, it is important to get a BCD that works for the Diving you will do. This is Rini's first couple dives using the Sidemount Configuration. Diving Instructor, Peter Crane fits the harness for her and gets in the water to teach her how to dive in a streamlined manner with full control over the cylinders as they are mounted beside you on the dive. Continuing on from our first buoyancy basics blog last week, we will move on to the difference between buoyancy in salt water compared to fresh water. If you haven't read last week's basics, please do, as it underpins what will be read here. During our scuba diving beginner courses, we learn that if we dive in Fresh water, we need to use less lead weight on a set diving equipment rig than we would in salt water. Generally speaking, if we move from the salty sea to a swimming pool, we drop around 2kgs off our weight belts. The answer is actually quite complex but we will look at it in the most simple terms possible. Again, it relates back to Archimedes Principle. Salt water is water with salt in it, therefore, it is heavier (for a given volume) than fresh water, which is water without salt!! 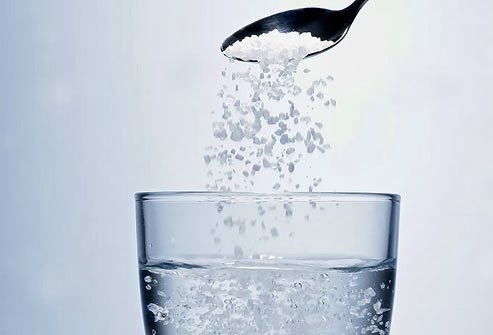 1 litre of fresh water weighs approximately 1 kg while salt water is more like 1.04kg per litre. This increased weight means the salt water has a greater upward or buoyant force. Archimedes principle states that an object will float or sink depending on the weight of water it displaces. If the weight of water the object displaces is more than its own weight, the object floats, while if the weight of the water displaced is less than that of the object, it sinks. So, imagine our 80kg diver is neutrally buoyant in fresh water. This is because s(he) displaces 80 litres of water giving an 80kg buoyant force counteracting the 80kg down force. If we move our diver to the sea, the additional weight of the salt in the water causes the buoyant force of the water to increase to approximately 83.2kgs, (80 x 1.04) which is greater than the 80kgs down force of our diver, making them more buoyant and in need of a few extra weights. However, the amount of salt in the sea varies depending on where in the world you are. Even diving in the Mediterranean, the seawater is much more salty around Cyprus than around the Western Med and of course, diving in the Dead Sea would require an awful lot more weight than pretty much anywhere else. So this isn't exactly a science that can be mathematically computed pre-dive. Tried and tested is to get in the water, do a weight check and scuba dive. You will eventually get the knack for guess-timating the weight that you will need as your environment and diving equipment changes. Scuba Tech Diving Centre Cyprus get the diving season going with their first trip out to the Zenobia wreck. This is a phenomenal wreck and hopefully, this little video will give you an idea of the size and fishlife you will find here.